Shuart, Hon. William Dean, was born in the town of Mendon, Monroe county, August 11, 1827, received an academic education, and attended Genesee Wesleyan Seminary at Lima, N.Y. He read law with D. G. Shuart, George P. Townsend and Smith & Cornwell, of Lyons, N. Y., and afterwards entered the Law School at Ballston, Spa, from which place he was graduated and was admitted to practice in Schenectady, N.Y., in 1850. The following year he opened a law office in Rochester, and in 1863 was elected city attorney by the Common Council. In June, 1864, he was commissioned in the army as paymaster, with rank of major, served until the close, and mustered out at Louisville, Ky., in November, 1865. He returned to Rochester and resumed his practice, and in 1867 was nominated and elected surrogate of Monroe county, twice re-elected, and served in all sixteen years. January 1, 1884, he formed a partnership with Hon. William A. Sutherland, under the firm name of Shuart & Sutherland, to which Hon. Arthur E. Sutherland was subsequently admitted but has since withdrawn. Mr. Shuart is a very successful practitioner, is authority on all cases involving the settlement of estates, and his decisions while surrogate were seldom reversed by higher courts, and is one of the most popular men and promising lawyers in Western New York. Herrick, C. Elbert, was born in Penfield in 1854, and was the son of Jerome B., and grandson of Rufus N. His mother was a daughter of Calvin Allen. In 1877 Mr. Herrick married Carrie L., daughter of N. S. Perkins and they live on the Calvin Allen homestead. They have three sons, Clinton S., Lloyd W., and Carl B.; also one daughter, Bessie M. One son, Ora E., died at the age of thirteen. Gaston, Joseph H., was born in Penfield in 1847, son of Joseph who came trom New Jersey to Wayne county in 1825 and later to Penfield, where he died March 22, 1879, aged seventy-four years, leaving two sons, Joseph and Daniel. In 1870 Joseph H. married Nira H., daughter of Niram H, Peet, and lived on the old homestead until 1876, when he bought the farm where he now lives. Mr. Gaston is one of the leading farmers in Penfield and since 1884 has been assessor. Mr. and Mrs. Gaston have two sons, Arthur H. and Harry L., also four daughters. Eldridge, Irving B., son of Erastus and Anna (Watson) Eldridge, was born in Penfield in 1839 and he is the grandson of William Eldridge, who fought in the Revolutionary war. Erastus Eldridge fought in the war of 1812, and in 1815 came to Penfield from Washington county. He married Anna, daughter of Samuel Watson, who came from New England and settled here in 1816. Irving B. was one of eight sons, three of whom now reside in Wayne county. He followed farming till 1886, when he moved into the village, and for two years conducted a store. He served as justice of the peace eight years, and in 1884 was elected supervisor. He married Marian E., daughter of James Lovett, who came here from Rhode Island in 1825. Fuller, C. Lacy, is the only son of Giles T. and Kate L. (Lacy) Fuller. His mother was a daughter of Charles Lacy, of Dutchess county, and his father, Giles, was the son of Harvey Fuller, and grandson of Joseph, the latter one of the early settlers of Penfield. Lacy Fuller, with his father, moved to Penfield in 1888, where his father died in 1889. He was engaged in life insurance for some time, but is now engaged in produce shipping, having bought a large warehouse in connection with Bown Bros. under the firm name of Bown Bros. & Fuller. Cutler, James G., appointed by Governor Morton as charter commissioner for Rochester, was born in Albany in 1848, and has been a resident of Rochester since 1872. He is an architect by profession. a fellow of the American Institute of Architects and an ex-president of the Western New York Chapter of the same; a member of the Architectural League of New York: for the past seven years a trustee of the the Rochester Chamber of Commerce, and now its first vice-president; vice-president of the Alliance Bank; president of the board of trustees of St. Peter's Presbyterian church; a director of the James Goold Company, of Albany: a trustee of the Post Express Printing Company; and has considerable real estate and manufacturing interests, in which he is associated with his brother, J. Warren Cutler. He is a Republican and active in public matters. He served four years as secretary of the joint water supply committee of the Common Council and Chamber of Commerce and is now serving on a similar committee on public markets. He was chairman of the Monroe county delegation at the Republican State Convention of 1894. Sloan, Samuel, son af Timothy Sloan, was born in the North of Ireland, near Belfast, in 1828, where he received his education. In 1848 he emigrated to the United States and upon arriving in New York secured a position with the first wholesale dry goods house on Broadway, and engaged in the Australian shipping business. He remained in New York until it became necessary for him, in the interests of his firm, to go to Melbourne, Australia, where he remained for six years. In 1860 he returned to America and came to Rochester and embarked in the steam and gas fitting business, as a partner of R. E. Sherlock, and continued under the firm name of Sherlock & Sloan until 1880, when, upon the death of Mr. Sherlock6 Mr. Sloan became sole proprietor, and is now conducting an extensive wholesale business in plumbers', steamfitters' and engineers' supplies. Mr. Sloan is one of the original trustees of the Reynolds Library, and is president of the Mechanics' Savings Bank. Watkins, George B. - The successful establishment and management of such a business as that of W. H. Glenny & Co. in this city is a task requiring so much commercial ability that the guiding mind in control must be possessed of rare qualifications; and a sketch of George Benton Watkins's career supports that view. Born in Utica, N.Y., August 12, 1852, of sturdy English descent, the youngest of ten children. his mother having died in his early infancy, he lived with an uncle on a farm until twelve years old. It was now that the elements of his future success began to manifest themselves. The farm could not hold him, and with the two-fold purpose of taking advantage of the more advantageous educational facilities and opportunities afforded in the city for making his own way in the world, he returned to his father's home. He attended the Utica High School, graduating therefrom at sixteen. While at school, in the early mornings he delivered papers, and in the afternoons worked in the newspaper office. Having secured a position in the leading crockery store of the place, with characteristic energy he applied himself to master the details of the business. His advancement in five years to the leading position in the store is an index of his success. His ambition still unsatisfied he looked for a position offering larger opportunities. This was secured with the firm of W. H. Glenny, Sons & Co., of Buffalo, N.Y., one of the largest importing houses in the country, their receiving, packing and shipping departments with its force of twenty men and ten boys being placed under his supervision. Strict attention to business and untiring energy brought further preferment, and soon he was in charge of their wholesale department. In 1876 the financial embarrassment of a Rochester house, largely indebted to Glenny, Sons & Co., necessitated the sending of a representative here to look after their interests. Mr. Watkins was chosen, and so well did he fulfill his trust, the local firm was enabled to pay all their indebtedness and continue their business. While attending to the company's interests here, Mr. Watkins was impressed with the desirability of Rochester as a point for the establishment of a permanent business. He suggested the idea to Mr. Glenny, who, after mature deliberation, decided to open a store and did so under the style of W. H. Glenny & Co., with Mr Watkins as manager. From its earliest inception the business here has been under the entire control of Mr. Watkins. Established on the broad basis of equity and integrity its growth has been one continuous success. In 1886 the elegant commercial building which the firm at present occupies at 190, 192 and 194 East Main street, was erected, and its seven floors are required for their constantly increasing trade. In 1891 Mr. Watkins was admitted to partnership, a well merited reward for his faithfulness and success. Of a retiring disposition, he is seldom identified with public interests, though often sought after. He is a charter member of the Chamber of Commerce, was five years director of the Y. M. C. A., and for ten years has been trustee and treasurer of the First Methodist Episcopal church. Mr. Watkins was married at the age of twenty-one to Carrie, daughter of Sanford Peckham, Madison, Oneida county, N. Y. He is a Republican, and resides at 626 East Main street. Kinney, Hon. John F., was born in Ogden, Monroe county, N.Y., June 20, 1860. He received his elementary education in the Union School at Spencerport, after which he took a collegiate course at St. Joseph's College; Buffalo. After graduating he began the study of law in the office of William H. Bowman. He afterwards graduated from the Albany Law School and was admitted to the bar in 1881. In January, 1890, a vacancy was created in the office of special qounty judge by the resignation of Judge Werner, and Governor Hill appointed Mr. Kinney to that position. Judge Kinney occupied the county bench so acceptably that in the ensuing election, when he was nominated by the Democratic party for special county judge, he was elected by a majority of 798 and was the only one on the ticket to escape defeat. As a lawyer he has conducted many important litigations and is regarded as one of the most able members of the Rochester bar, while as a judge he has distinguished himself by his able, comprehensive and impartial decisions. In 1883 Judge Kinney married Elizabeth J. Hanlon, of Albany, by whom he has two sons and two daughters. He resides at No. 64 Lorimer street. Garlock, James S., was born in Parma, N. Y., January 4,1836. He attended the public schools and later became a student at the Genesee Wesleyan Seminary at Lima, N. Y., then entered the Genesee College, and later attended the Satterlee & Dexter Collegiate Institute in Rochester. Upon choosing law as his profession he entered the office of Joseph A. Stull, and was admitted the the bar in 1860, at which time he began to practice in Rochester. In 1863 Mr. Garlock raised a company of cavalry for the 24th Regiment New York State Vols., and was mustered in as first lieutenant and commissary of the regiment. In 1864 he resigned his office and resumed the practice of his profession. He is regarded as one of the leading attorneys of the county. Spahn, Jacob, was born in the city of Wartzburg, kingdom of Bavaria, Germany, February 24, 1849, of military stock and the second son of Andrew Spahn, soldier and revolutionist, who was compelled to flee from his native land the same year and who was himself the son of a veteran under Napoleon who survived the retreat from Moscow. He received his primary education in the public schools of New York city. The elder Spahn was for many years a manufacturer of mouldings, in business with the late overseer of the poor, Joseph Schutte, on State and Water streets, prior to 1875. He settled in Rochester in 1862, where Jacob Spahn entered college and graduated from its university in 1870, having made his mark to some extent in literature, for in his junior year a sketch, "The Prince Suwarow," which he had written, appeared in the Galaxy Magazine. Like his brother, Louis Spahn, of the Chicago bar, he secured the first Davis Medal of his year for oratory in his class on commencement day. During his college course he joined the Theta Delta Chi Fraternity and was its orator twice in 1873 and 1883. He was appointed major and engineer of the 25th Brigade National Guard April 21, 1877, by Governor Lucius Robinson. Upon leaving college he became a journalist, working successfully upon the staffs of the Union and Advertiser and the old Chronicle, whose city editor he became and remained until that paper's consolidation with the Democrat in 1872. He was admitted to the bar in Buffalo, N. Y, June 21, 1871, after reading law with Hon. Francis A. Macomber, afterward a justice of the Supreme Court. In 1878 he became one of the organizers and secretary of the big Genesee Brewing Company at Rochester. At about the same time he began to take an interest in local politics and was nominated unanimously for member of Assembly by the city convention, but declined the honor. The same year he was appointed to write and deliver the poem before the associate Alumni of the University of Rochester. From 1878 to 1881 he officiated as military editor of the Sunday edition of the Democrat and Chronicle. As such he allowed many criticisms upon the local military to appear and was in consequence court-martialed and cashiered from military rank after a long trial, covering thirty sessions of the court, prosecuted against him by Hon. George Raines, then the judge advocate; but he secured a review of the case by writ of certiorari from the Supreme Court, which reversed the sentence and reinstated him. From this decision an unsuccessful appeal was taken by the adjutant-general. Major Spahn had for a short period theretofore officiated as temporary judge advocate of the local military and is still an officer in the National Guard S. N. Y., having been honorably retired from active service by order of Adjutant-General Josiah Porter in 1886. His court-martial case now constitutes a precedent in military law. He has a commission as colonel. Since his retirement from journalism he has written many sketches and done general literary work for the magazines, among others the Galaxy, Harper's, Green Bag, Albany Law Journal, &c., besides the local papers. His law practice is general and mainly confined to Germans, among whom it is very extensive and must have been successful because he is a large tax-payer. As the oldest practitioner of German extraction in Monroe county he is the dean of that nationality among the lawyers. One of his principal cases was to defeat the Rochester and Glen Haven Railroad Company from condemning the premises of Ferdinand Grisbel under the right of eminent domain in a proceeding begun in the Supreme Court, which is always a rate victory under the railroad law, The case is reported in 14 N. Y. Supplement 848. He also established the pioneer precedent in the State with reference to the police powers of cities as to shade trees on streets and their removal under city ordinance, in the case of Ellison vs. Allen reported in the 67 State Reporter 274. For many years he has been a discriminating book buyer, and now possesses not only a law library containing with one exception every decision published in the State; but one of the largest collections of standard miscellaneous literature in the city. As a tax-payer his frequent denunciation of alleged municipal extravagance and mismanagement have furnished him quite a political following. Nominations to office are from time to time tendered him by his friends and neighbors, but. up to date he has shown no inclination for public life. At present he figures as chairman of a permanent good government club irrespective of party, formed from among the leading citizens in the 6th, 8th and 16th wards, and as such he was authorized to call a meeting any time for action at the election polls in these wards. Williams, Charles M., was born in Rochester, N. Y., April 80, 1851, eldest son of Charles H., and grandson of Rev. Comfort Williams, the first settled pastor of Rochester, N. Y. Mr. Williams received his early education at the Free Academy of this city and was graduated from the University of Rochester in 1871, at which time he entered the office of E. A. Raymond, as a student at law; he was afterward in the law office of Hon. John Van Voorhes, and was admitted to the bar in 1875, at which time he entered in co-partnership with J. R. Fanning, for the practice of general law. In 1879 he was elected school commissioner of the sixth ward, being nominated by both parties. In 1888 Mr. Williams was elected a member of the Board of Trustees of the University of Rochester, and has been its secretary and treasurer since 1891. Cummings, Scott, was horn in 1852 in Cattaraugus county, this State. His education was derived from the common schools, and a few terms at an academy, in connection with special courses of study. His father, John T. Cummings, was a man of excellent mind, character, and intelligence. The son inherited the disposition for general reading, and early acquired this wholesome habit, so that his education came largely from self-help. Mr. Cummings pursued a four years' course of legal study, and was admitted to the bar of this State at Buffalo, General Term, in June, 1881. For five years thereafter he practiced law in Erie county. In the spring of 1886 he removed to the city of Rochester, since which time he has been the attorney and counsel for the mercantile agency of Messrs. R. G. Dun & Co., and which position he still holds. Barnes, Charles R., was born in Rochester, N. Y., in 1853. and at an early age was appointed telegraph operator at Spencerport, N. Y., where he studied electricity as much as opportunity permitted. He was appointed superintendent of fire alarm system of Rochester and afterwards city electrician, in which capacity he still serves. Mr. Barnes has just completed the construction of an electric yacht, which is quite a little marvel. Lodge, Clarence V., was horn in Henrietta, Monroe county, N. Y., June 24, 1853. He was educated at Henrietta, at Auburn, N. Y., and in 1873 was graduated from the Genesee Wesleyan Seminary, after which he conducted a farm in Henrietta until 1886, when he was appointed keeper of the Monroe county Alms House. In the fall of 1894 he was elected county superintendent of the poor for three years. His father, James L. Lodge, came to Henrietta from Cayuga county in 1852 and still resides there. He married Mary D. Savery and has had two sons, Clarence V. and Lionel S., the latter a dentist in Buffalo. Clarence V. Lodge was married November 15, 1876, to Miss Nellie S., daughter of William Remington, of Henrietta. Walter, John A. P., was born in 1846, in the Electorate of Hesse, near Frankfurt on the Main, and came to this country with his parents in 1855 and located in Rochester, where be attended the public schools, and later the Lutheran Parochial schools. In 1862 Mr. Walter enlisted in Company H, 105th N. Y. Vols., and served several months, when he was transferred to the 94th New York Volunteers, and served in that company until the surrender at Appomattox. He was in the battles of Cedar Mountain, Gettysburg and Petersburg, and was honorably discharged in 1865, at Albany, N. Y., as commissary sergeant of his regiment. In 1866 he returned to Rochester and joined the National Guard, from which he resigned as captain. At that time he began working at his trade as tinsmith, and in 1872 started for himself in the general hardware business at No. 198 Hudson street, and is still in that business under the firm name of Walter & Son. Mr. Walter was a member of the Board of Supervisors from 1879 until 1881. In 1891 he was appointed City Fire Marshal, which office he has held for the last four years. He is a member and past commander of Peisner Post No. 106, G. A. R., member of Monroe Commandery No. 12, K. T., the Odd Fellow fraternity, the order of Redmen, the Knights of the Maccabees, etc. Kuichling, Emil, was born in Germany in 1848, son of the late Dr. Louis Kuichling. He received his early education in Rochester, and in 1868 was graduated from Rochester University. and the following year he took the post-graduate course and received the degree of Civil Engineer. In 1872 he entered the Polytechnic school at Karlsruhe, Germany, where he spent three years in the further study of his profession, and in the spring of 1873 he was appointed assistant engineer on the water works of this city then in process of construction, which position he held for ten years. The fall, winter and spring of 1883 - 84 were spent in Europe in the study of the sanitary conditions of the sewerage systems and water supplies of large cities. In the spring of 1885 Mr. Kuichling was elected a member of the executive board of this city on the Democratic ticket, and after serving two and a half years he made the survey and preliminary plans for the east side trunk sewer, which work occupied his time for nearly two years. He spent the summer of 1889 in Europe, studying municipal engineering, especially the various methods of sewerage disposal. Upon his return be was engaged by the East Jersey Water Company as assistant engineer in the preparation of plans for the large street conduit for the water supply of Newark, N. J., and he remained on this work until the fall of 1890, at which time he was appointed as chief engineer of the Rochester water works, and to prepare plans for the new conduit which is now completed. Mr. Kuichling has been called as an expert witness in many judicial proceedings. He is a member of all branches of the Masonic order. O'Brien, John Charles, was born in Rochester, N. Y., May 8,1838. In June, 1856, he was graduated from Hobart College with the degree of B. A., and in 1881 received the degree of Master of Arts. He read law with Judge Charles J. Folger, of Geneva, N. Y., and in 1863 was graduated from the Albany Law School, where he received the degree of L.L.D., and also passed the General Term examination, and subsequently was admitted to the United States District and Circuit Courts. He was acting assistant district attorney under William H. Bowman and C. C. Davison. He was the first supervisor of the fifteenth ward, and for the second term was nominated on both the Democratic and Republican tickets, but declined to accept the office. January 31, 1867, he married Agnes E. O'Leary, of Ontario, by whom he had six children. Two of his sons have been graduated from the University of Toronto, and one from Cornell University. The oldest son is to be associated with his father in the practice of law in this city. Mr. O'Brien's practice has been chiefly in the drawing of wills, the settlement of estates, and as referee. Crittenden, William Butler, was born in Deerfield, Mass., August 5, 1851, at the Memorial Hall, which was then Deerfield Academy, of which his father, Cotton M. Crittendon (formerly librarian of the Court of Appeals Library at Rochester), was principal. He received his education from his father, who moved to Rochester in 1853. He studied law in the Boston University Law School, was upon the reportorial staff of the Boston Journal from 1872 to 1874, and was admitted to the bar in 1876, at Rochester, N. Y., where he has since practiced his profession. Sprague, George W., son of Foster and Elvira Sprague, was born in Coburg, Ont., May 14, 1888, and the following year removed with his parents to Rochester. He attended the public schools for some years, after which he entered into partnership with his father, and carried on a general hardware store in this city under the firm name of F. Sprague & Son. In 1875 he sold his interest in the hardware business and entered into the fire insurance business, in which he still continues, representing a number of first-class English and American companies. He is a member of the Rochester Board of Underwriters. Hulett, Pierson B., was born in Brighton, Monroe county, N. Y., November 17, 1837. He became a student of law and was admitted to the bar December 18, 1858, at the General Term in Rochester, where he has been a most successful practitioner. In 1875 Mr. Hulett was elected special county judge and served in that capacity for three years. and was re-elected in 1879. In the fall of 1884 he formed a partnership with Vincent M. Smith, as Smith & Hulett, which terminated with Mr. Smith's death in May, 1886. About two years ago the present firm of Hulett & Gibbs was formed. Mr. Gibbs was a student of Mr. Hulett's. Hone, Frank J., was born in Rochester, August 9, 1857, and is a son of Alexander B. Hone. His early education was received in private schools of this city, and in 1879 he was graduated from Seton Hall College, of South Orange, New Jersey, at which time he began the study of law in the office of Rowley & Johnson, of Rochester, and was admitted to the bar at the general term in October, 1881. 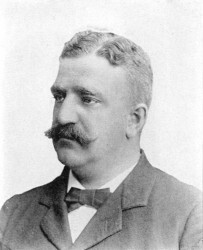 In 1884 he formed a co-partnership for the practice of law with Charles B. Ernst, which has since continued, and upon Mr. Ernst being appointed city attorney Mr. Hone was associated with him as assistant city attorney, and while holding that position he was the acting counsel for the Board of Park Commissioners of Rochester, and of the Board of Health of this city. Upon retiring from the office of assistant city attorney be was appointed attorney for the Board of Health, which position he still retains. Lewis, Hon. Merton E., was born in Webster, Monroe county, December 10, 1861. He attended the Webster Union School and was graduated in 1882. He read law with James B. Perkins, of Rochester, and was admitted to the bar in this city in June, 1887. In 1890 he was elected alderman of the Sixteenth ward, to fill the vacancy caused by the resignation of H. G. Thayer; he was re-elected in 1891 as alderman of the Eighteenth ward, and in 1895 became mayor on the resignation of George W. Aldridge. In 1886 he married Adeline L. Moody, of Webster, N. Y., who died June 9, 1894, leaving two sons, Donald and Roscoe. He was elected president of the Common Council in 1894, and is also president of the Riverside Cemetery Association. His father, who was born in New Jersey in 1826, now resides with his son in this city, was one of the early settlers of Wayne county. Merton E. Lewis was elected delegate to the National Convention in 1894, and is the senior member of the law firm of Lewis & Jack. Yeoman, George F., ex-justice of the Supreme Court for the Seventh Judicial District of this State, was born in Delaware county, N. Y., in 1846. He studied at the University of Rochester, and began the practice of law in this city in 1875. The death of Judge Francis A. Macomber caused a vacancy on the bench and on November 10, 1893, Governor Flower appointed Mr. Yeoman to fill the same. He took the oath of office November 15, 1898, and retired December 31, 1894. Block, Alvin, was born in Rochester, N.Y., April 30, 1862, where he attended the public schools and later became a student at the Rochester Free Academy, from which he was graduated in 1880. He then entered the office of Fanning & Williams for the purpose of studying law, and later the office of Charles M. Allen, from which he was admitted to the bar in 1885. In 1885 - 86 Mr. Block represented the Twelfth ward as a member of the Board of Supervisors. He is a very sharp and shrewd attorney; which has won for him a large practice. 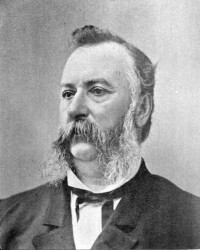 Rochester, John H., vice-president of the Board of Park Commissioners, is the last male representative of the famous family by which Rochester was founded and after whom it is named. He was born here April 20, 1828. He was educated in the schools of this city and at the age of eighteen entered upon his life work in the Rochester City Bank, of which his father, Thomas H. Rochester, was president. He subsequently carried on a private banking business for five years with his brother under the name of John H. Rochester & Bro. Then he became cashier in the Flower City Bank for three years. When the Mechanics' Savings Bank was chartered and entered upon its career, John H. Rochester became its secretary and treasurer, a position he has filled ever since for a period of over twenty-seven years, being the oldest banker in active service in this city. He has been connected with social, religious and public institutions throughout his career. He is a member of the Genesee Valley and Whist Clubs and was for three years president of the Rochester Club. He is the oldest member of St. Luke's church in point of years of membership. He has been treasurer of the Church Home for twenty-five years; treasurer of the Red Cross Society and yellow fever fund; is president of the Rochester Historical Society, and, as stated above, vice president of the Board of Park Commissioners. He has traveled extensively and is a well informed and public spirited citizen. He has always taken a deep interest in public affairs of his native city, but has never sought or held public office, He married, in 1853, Elizabeth L. Moore, of Vicksburg. He has two sons: Thomas M., a practicing physician in Brooklyn, and Paul A., in the railroad service in New York. Mr. Rochester is one of the foremost citizens in Rochester and one of the hardest working of the commissioners. He has always taken an interest in the parks and is a man of practical ideas. His selection to the board was a wise one and he was honored at the first meeting by an election as vice-president. John H. Rochester is the kind of man who honors a city by public spirit and enterprise. Cook, John C., was born in Rochester, October 8, 1857, and was educated in public and private schools. His father, Levi, was a skilled mechanic, and naturally the son developed considerable ability in that direction in his early years, but subsequently developed a preference for mercantile pursuits, and on the 14th of February, 1876, he was tendered a position in the Rochester office of R. G. Dun & Co. His faithfulness to the interests of the business won him the confidence of his employers and after a few years he was assigned the duties of chief clerk; he was subsequently appointed assistant manager, which position he held for a number of years, until January 1, 1893, when he was appointed manager, which recognition by the company was highly complimentary to Mr. Cook, as he is the youngest manager whom they have entrusted with their large and growing business in Rochester. He is favorably known by all business men in this community, thoroughly posted in his business, and his untiring efforts to serve the patrons of R. G. Dun & Co. have gained for him an enviable reputation. He was married to Jennie M. Plass in 1880, by the venerable Dr. James B. Shaw, which union has been blessed with three children, two of whom are now living, Mildred E. and Howard M. Mr. and Mrs. Cook are members of the Brick Presbyterian church, with which they have been connected a number of years. Hebing, Henry, was born at Bochold, Germany, November 24, 1834. He attended the schools of Rochester, where he received his academic education. In 1855 he engaged in the hardware business as clerk for Galen & Moore. The firm of Moore, Hebing & Co. followed them in 1859 and conducted a successful business until 1864, when Hebing & Miller succeeded. In 1866 Mr. Miller retired and since that time Mr. Hebing has conducted the business alone. He has always interested himself in public affairs, and has filled various positions in the gift of his fellow citizens. He represented the Twelfth ward in the Common Council for two terms from 1861 to 1865, and the Sixth ward in 1879 and 1880. In 1888 he represented the district in the Electoral College, and in August, 1889, was appointed collector of customs for the port of Genesee. For several years he has been a director of the German American Bank, and a member of the Chamber of Commerce, and has been a member of the Mannerchor for more than a quarter of a century and president of the organization for half that time. It may be safely affirmed that no one has contributed more than he to the education of this community in the most delightful of all arts, while in addition to this, his gifts and skill as an amateur painter have found expression in the production of some work of rare merit. Sibley, Rufus Adams, was born at Spencer, Mass., December 3, 1841, being a lineal descendant of John Sibley, who came from St. Albans, England, and settled at Salem, Mass., in 1629, about ten years later than the settlement of Plymouth. He is also a lineal descendant of that Henry Adams, who arrived from Devonshire, England, and settled at Quincy, Mass., in 1632, to whom Pres. John Adams erected a monument in the old burying ground at Quincy, Mass., which bears this inscription "In memory of Henry Adams, who took his flight from the dragon persecution in Devonshire and alighted with eight sons near Mt. Wollaston." Also a lineal descendant of John Livermore, who arrived in New England, in 1634, and settled in Watertown, Mass., in 1642. At the age of fifteen Mr. Sibley taught the winter term in a district school, and a second term the year following. At seventeen he entered a general store as clerk and bookkeeper, where he remained five years, leaving this situation for the purpose of completing his studies in civil engineering at the Lawrence Scientific School of Harvard College. He decided, however, to accept a position in the office of Hogg, Brown & Taylor, at Boston, remaining there three years, when he resigned in order to commence the dry goods busines in Rochester, N. Y., under the firm name of Sibley, Lindsay & Curr, in March, 1868. Mr. Sibley was married October 11, 1870, to Martha, daughter of Rev. John Haven, of Charlton, Mass., who died in 1885, leaving a son, Edward R. Sibley. He married Elizabeth Sibley Conkey, in 1888, by whom he has two children. Since the foundation of the business house referred to, Mr. Sibley has been closely identified with the growth and prosperity of the city of his adoption, and has large interests in other portions of the United States. The twelve story, fire-proof structure, known as the Granite building, in Rochester, erected by the firm of Sibley, Lindsay & Curr, in 1893, is an important contribution to the growth of the city. Mr. Sibley is a trustee of the Rochester Savings Banks, of the Rochester Trust and Safe Deposit Company, of the Security Trust Company, the Industrial School, the City Hospital, and the University of Rochester, and a director in several corporations, and is, at the present time, actively engaged in the dry goods business with his partners in Rochester, New York city, Erie, Pa., and in Minneapolis, Minn., with offices in England, France, Germany, and Switzerland. Paine, Cyrus F., was horn January 16, 1827, at Broadalbin, Montgomery county, N. Y. At the age of nine years he removed with his parents to Albion, Orleans county, N. Y., where he received his early education, graduating from the Albion Academy. He came to Rochester in 1846 and entered the book store of Sage & Brother, where he remained until 1852, when he formed a partnership with Alfred S. Lane. Together they purchased the stock of drugs of L. B. Swan, and Mr. Paine remained an active member of the firm until 1888, when he retired from active business, leaving the management of the store to the firm, which is well known throughout Western New York as the Paine Drug Company. In 1853 Mr. Paine was elected treasurer and in 18th trustee of the New York Baptist Union for Ministerial Education, which position he has since held. He has also been trustee of the Monroe County Savings Bank for the past twenty-five years, is a trustee of the Reynolds Library, and was a member of the Common Council in 1866-68. The family in America is descended from Thomas Paine, who came to Massachusetts from England in 1621. It is one of the oldest families in genealogical descent in the United States and traces its lineage in an unbroken line to the earliest accessions to the Plymouth Colony. Cyrus T. Paine's father, Dr. L. C. Paine, was born in Shaftsbury, Vt., November 9, 1787, and died in Albion, N. Y., January 8, 1873, where he was in active practice up to within a few years of his death. Dr. Paine was appointed surgeon of the 121st Regiment of Infantry of the State of New York, April 29, 1814, by Gov. Daniel D. Tompkins. Foote, Nathaniel, son of Nathaniel Foote, was born in Morrisville, N. Y., November 15, 1849. He received his early education in his native town, after which he entered the Cazenovia Seminary, where he remained for two years, when he entered the Genesee Wesleyan Seminary at Lima, N. Y., and was graduated in 1866; in 1870 he was graduated from Hamilton College as Bachelor of Arts, and afterward received the degree of Master of Arts; he then became instructor of classics at the Monticello Academy, where he remained one year, after which he began the practice of law in his native town and formed a partnership with John E. Smith, which continued until July, 1873, when he came to Rochester and opened an office. Mr. Foote is recognized as one of the leading attorneys of Western New York. January 10, 1872, he married Charlotte, daughter of the late James C. Campbell, of this city. Mr. Foote was for three years a member of the law firm of Stull, Foote & Taylor, and later of Stull & Foote, and is now senior member of the firm of Foote & Haven, with offices in the Granite building of Rochester. Mr. Foote was one of the delegates from this senatorial district to the Constitutional Convention, which made and submitted to the people the Revised Constitution of the State which was adopted in 1894. On the organization of the Rochester Bar Association in 1898, Mr. Foote was chosen as its president and re-elected to the same office the following year. Butts, Simon, was born in Monroe county, Pa., in 1822, and came to the town of Greece with his parents in 1832, was educated in the public schools, and followed the occupation of farming. He was married twice, first, in 1850 to Elizabeth M. Lowden, and they had two children: Emmett, who died in his fourth year, and Flora, now Mrs. John Desmond of Rochester, and they have one daughter, Laura M. Mrs. Butts died March 12, 1855. For his second wife, March 21, 1860, he married Sarah B. Way of this town, and they have had six children: Nellie D., Martie M., George W., Anna L., Sadie H., and Chesa M. Anna L. died in infancy. George W., who was a promising young man, died in his twenty-second year. Mr. Butts s father, Christian, was born at the old home in Pennsylvania in 1790, was a cooper by trade, and came to Rochester in 1824 and went to work for Benjamin Wilcox at the Rapids and moved to Greece as above stated. He married Mrs. Elizabeth Arnold of his native State and they had six children: Daniel, Simon, as above, Sarah A., Betsey, Mary and Susan. Mr. Butts died in 1888, aged ninety-eight years, and his wife in 1876. Mrs. Butts s father, William B. Way, was born in Cape May, N. J., March 9, 1803, and was a farmer by occupation, and came to Western New York in 1838. He married Deborah A. Ellis of Burlington, N. J., and they had five children that grew to maturity: Micajah E., Anna M., as above, William B., who was a soldier in the war in the 9th Michigan Cavalry Vol., was honorably discharged at the close of the war, and died soon after reaching home, Sarah B., as above, and Bertha M., who died some years ago. These old families have been identified with the best interests of the town and county since they came here. Morgan, Mrs. D. S - Dayton S. Morgan was born in Ogden, November 17, 1819, son of Samuel Morgan, who traces his ancestry to James Morgan, of Wales, who came to the United States landing at Boston in April, 1636, and settled in Roxbury, Mass. Samuel left Connecticut in early life with his father s family and came to the Mohawk Valley settling in Herkimer county but afterwards came to Monroe county where they were all engaged in farming. Samuel married Sarah Dayton; he was always prominent in all good measures, both religious and moral, and took an active part in the early development of the town. Dayton S. was educated in the Brockport Collegiate Institute, and at Herkimer, and as a young man took an interest in the leading social, religious and charitable institutions near him. In 1844 he entered into partnership with William H. Seymour. in the manufacture of mowers and reapers, which business developed into a gigantic enterprise, known not only throughout the United States but in all foreign countries. In 1864 he married Susan M. Joslyn, daughter of Isaac Joslyn. of Oneida, and they are the parents of seven children: George D., William P., Henry, Gifford, Mrs. Sarah Manning, of New York city, Susan, and Gladys B. Dayton S. took a deep interest in the development of Brockport, its schools and religious institutions, and was vestryman of St. Luke s church for twenty years. Mr. Morgan died in 1890, aged seventy-one years, a loss not only to his immediate family but to all who knew him. Clark, Charles H., was born in Yates, Orleans county. December 14, 1842. 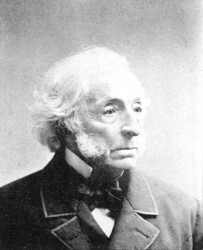 His father, Lambert Clark, settled in that town about 1880, was one of the founders and supporters of the old Yates Academy, and died there in 1889. After receiving his education in the district schools and pursuing a course of study at the local academy Charles H. Clark came to Rochester, where he began active life in a machine shop on a very small salary. Since then he has followed, in one capacity or another, the machinist's trade, rising through all its branches to proprietor and employer. For seventeen years connected with the firm of Sargent & Greenleaf, lock manufacturers, working in their establishment as contractor and foreman. In 1804 he started in business for himself manufacturing machinery, special tools, punches, dies, formers, and metal specialties. He originated a kerosine oil heating system for machinery and also many other devices of practical and general utility. Since 1890, when his brother, Morris F. Clark, was admitted to partnership. the business has been conducted under the style of the Clark Novelty Company. July, 1895, the firm moved to its present quarters at Nos. 380 and 382 Exchange street. Starting in a small way with limited facilities, the concern has grown into one of the important manufacturing industries in Rochester, anti commands a trade extending over a wide territory. In 1868 Mr. Clark married Sarah A., daughter of Humphrey Jones, a retired woolen manufacturer of Rochester. They have had two sons: C. Herbert, born November 24, 1874, a graduate of the Rochester Free Academy, class of '93, and Laurens M., born June 12, 1888. Warner, J. Foster - The Warner family in America of which J. Foster Warner, of Rochester, is a representative, descends from Amos Warner, sr., a resident of Connecticut, who served three years in the Continental army during the Revolution. He was the father of Amos, jr., whose son, Andrew J. came to Rochester in l847. The latter was a draftsman in the office of his uncle, Merwin Austin, architect, and made the drawings of the old court house, which was torn down to give place to the new structure in 1894. J. Foster Warner, son of Andrew J.. was born in this city May 5, 1859, and received his education in the schools of his birthplace. Deciding upon architecture as a life profession he entered the office of his father, to whose artistic conception many of the earlier buildings of Rochester and vicinity are indebted; afterwards he was for one year in the office of Charles H. Marsh, architect, of Detroit, and upon returning to this city formed a partnership with his father, which continued successfully until 1889. Since then he has practiced alone. Mr. Warner is one of the leading architects in Western New York and has acquired a wide reputation. Possessing in a high degree the finer qualities of an artist he has exemplified the conceptions of a master in many handsome structures which grace the city of Rochester and other centers of activity. In purity of outline his designs are clear, concise, and forceful, while in style and finish they are at once beautiful and striking. Among the numerous buildings that stand as monuments of his skill are the Rochester State and Homoeopathic hospitals and the Granite building, the handsome new Monroe county court-house and the present George Eastman and William H. Gorsline residences on East Avenue; many others might also be mentioned. In 1883 Mr. Warner married Mary L. Adams, of Rochester. He is a member of the Genesee Valley Club, the Rochester Yacht Club, and the Society of Sons of the American Revolution. Garson, Charles, was born February 16, 1862, and received a common school education. He began the study of designing clothing, for the product of which Rochester has a world-wide reputation. Mr. Garson has made a great success of his avocation and is regarded as one of the leading designers of the country. In 1889 he started an extensive clothing factory of his own, and is now one of the foremost manufacturers of this city. Atkinson, Hobart Ford, son of William Atkinson, a prominent miller of Monroe county, was born in Rochester, N. Y., October 5, 1825. and was educated in the public schools of his native city. At an early age Mr. Atkinson began his banking career as clerk in the old Commercial Bank, and was gradually promoted until he became cashier, which position he filled until the closing of that bank. After its reorganization be was elected president and served for several years. In 1888 he was elected vice-president of the Bank of Monroe, and the same year was appointed one of the executors of the large estate of Hiram Sibley. In 1855 Mr. Atkinson married Miss Louise, daughter of the late Hiram Sibley, who died in 1865, leaving two daughters. In 1875 he married for his second wife Miss Harriet, daughter of James P. Appleton. of Manlius, N. Y.
Brewster, Henry C., son of Simon L., was born in Rochester, N. Y., September 7, 1845, and was educated in the public schools. In 1863 he entered, as clerk, the Traders National Bank, was appointed cashier in 1868, and, after faithfully serving over twenty-six years in that capacity, was elected vice-president in January, 1895. October 5, 1876, he married Alice E., daughter of the late Louis Chapin, of Rochester, N. Y. Mr. Brewster has always been prominently identified with the Republican party and in the fall of 1894 was elected, by an overwhelming majority, member of Congress; he is also commissioner of Mt. Hope cemetery, director of the Rochester and Genesee Valley Railroad Company, vice-president of the Alliance Bank, vice-president of the Rochester Trust and Safe Deposit Company, trustee of St. Peter s Presbyterian church, director of the Eastman Kodak Company, governer of the Rochester Homoeopathic hospital, director of the Rochester and Irondequoit Railroad Company, and the Rochester and Lake Ontario Railway Company, vice-president of New York State Bankers Association, a member of the Genesee Valley Club, and Rochester Whist Club, and is one of the most popular and enterprising men in Rochester. He was one of the originators and a charter member of the Chamber of Commerce, of which he was for two years first vice-president and for one term president. He was also for four years president of the Rochester Clearing House Association, and has long been prominently identified with the material growth and prosperity of the city. Gibbs, Everett O., son of Warren S., who came to Rochester about 1860, was born in this city April 1,1870. He was educated in the public schools of Rochester and Syracuse, and later was under the private tutelage of Prof. F. M. Sparling. In September, 1887, he entered the office of ex-Judge P. B. Hulett for the study of law, and was admitted to the bar at the Rochester General Term, March 30, 1898. The same year he formed a partnership with his preceptor, under the firm name of Hulett & Gibbs, which still continues. He is a member of the Flour City Democracy, and one of the rising young attorneys of Rochester. Fenn, Albert O., was born in Rochester, September 5, 1861, and son of William W. and grandson of Harvey C. Fenn, who came to this city in 1826. He received his early education in No. 5 School, and in 1878 was graduated from the Rochester Free Academy. Mr. Fenn has been connected with the banking business from the first, starting in as messenger boy for the Commercial Bank, then located in the old Wilder building, corner of Main and Exchange streets. In 1880 he became connected with the Traders Bank as collection clerk, and during his fourteen years service occupied each position successfully up to that of paying teller. In 1893 he severed his connection with this bank and became interested in the formation of the Alliance Bank, accepting the position of cashier, which he still holds. The demise of Vital Rèche which occurred at the family residence, 31 Howell street, the twenty-fifth of April, 1894, was a notable event in the history of the city. For fifty-eight years his fine, manly form was familiar to the inhabitants. On the day of his disease he was exactly ninety-nine years, six months and one day old; the oldest citizen of Rochester and probably the oldest man in Western New York. Mr. Rèche was a French-Canadian, the son of Antoine Rèche and Marie Grandbois. He was born at Nicolet, Canada, October 24, 1794, and was the descendant of a distinguished family. About 1645 fifteen families of the most prominent sons of France came to Quebec. One of these colonists, Dr. Louis Pinard, a distinguished surgeon in the French army, married Mlle. Ursule Pepin, of a good old family. Of four sons born to them two settled at Nicolet and registered under the names of Pinard and De Beauchemin, the latter being a family name. Of the other two sons one took the name of Rèche, from an uncle on the father's side; the other that of Florent De La Clair, from an uncle on the mother's side. Thus the Pinards, De Beauchemins, Rèches and De Le Clairs are all one family. Young Rèche attended the school founded at Nicolet in 1801, by Rev. Charles Brassard, and while there was a fellow-student of Mgr. Provencher, well remembered by French-Canadians. After graduating from the college of Nicolet, where he spent five years, he went to Quebec to study architecture. About 1815 he left for St. Marie, in the county of Beauce, where he became well known as an architect. Meanwhile he was married at Montreal the fifteenth of November, 1820, to Mlle. Helene F. Hantz, a native of Porrentruy, Switzerland. While in Canada he received his commission twice as an ensign and later as a lieutenant. Passing through Portland, Maine, where he had some thought of locating, he came to Rochester in 1836, where with the exception of three years spent in California, he passed the last fifty-eight years of his life. During the rebellion of 1837-8, he acted as a patriot towards his oppressed countrymen; and his oldest boy, L. M. Rèche, then scarcely fourteen, was often entrusted by Wm. Lyon MacKenzie with secret papers to convey to and from Canada, successfully escaping detection. From 1836 to 1845 he engaged in the grocery business on the site where Carroll, Beadle & Mudge are now located; from 1845 to 1854 he resumed his profession as an architect, when he left for California, where he remained for three years, gold hunting and designing. After his return from California he established himself in business as a coal dealer until 1882, when he retired. Mr. Rèche had issue - four sons and four daughters, six of whom survive, two sons having pre-deceased their father. The Misses Flora, Theresa, Eugenie and Helen Rèche live at the family residence; the two surviving sons in California; Vital C. Rèche at Fall Brook, California, and Antoine C. Rèche at Rèche California. Besides these the family counts nine grandchildren and three great-grandchildren. The longevity of the Rèche family particularly on the male side, has been remarkable; Mr. Rèche's grandmother lived to he 104. Amabel Rèche. one of his uncles, died at 100. Joseph, another uncle was over 100; one of his brothers who died about five years ago, lived to be ninety-nine years and nine months, and several cousins reached a ripe old age. One cousin, Philip Rèche, who died in Maryland in 1893, was on the committee which welcomed La Fayette to Baltimore in 1825. The family is in possession of a unique legacy, namely, a mass or correspondence from men of eminence in connection with the French government whom Mr. Rèche met at Rochester, going with them to Niagara Falls on their way to the centennial fète at Yorktown, the celebration of the siege and capture of which is so closely connected with the name and fame of LaFayette. The collection consists of numerous letters from Col. De Pusy, the Marquis of Rochambeau and other descendants of the family of La Fayette, also cards, photographs, wedding and birthday announcements, and from Gen. Boulanger and others of the nobility of France, by whom Mr. Rèche and his daughters were royally entertained while abroad in 1883. Among those whom Mr. Rèche met at the Yorktown fète was Col. Lichtenstein, the representative on that occasion of President Grevy, who subsequently sent Mr. Rèche his photograph, a high favor according to French etiquette. Mr. Rèche was the principal founder of the French Catholic church in this city and a member of St. Mary's church for twenty-six years. It is now fourteen years since Alonzo C. Whitcomb departed this life, but his services to the community were of such lasting value and his personality was so marked that all his wide circle of acquaintances will recognize the propriety of placing his name among those of the prominent men who have contributed to the rise and progress of Rochester. Alonzo C. Whitcomb was born in Pittsford, New York, June 24, 1824. His early life was passed in the country and while still a young man, he began the business in which he subsequently acquired fortune and that reputation which until this day attaches to the famous hotel which he established in this city and which still bears his name, the Whitcomb House. Mr. Whitcomb had experience as a hotel man in Parma, Clarkson and Brockport before he came to Rochester and entered a career which made him the most prominent hotel landlord of this city. His first hotel in Rochester was the Exchange, which stood at 80 to 84 on West Main street. He next became owner of the National, which stood on the Northeast corner of Main and Fitzhugh streets; he conducted the National for nine years. In 1872 he built the Whitcomb House and was conducting it up to the time of his death. Mr. Whitcomb was a supervisor for one term and served three terms in the Common Council. He was an ardent admirer of horses and was one of the organizers of the Rochester Driving Park association. His interest in agriculture was demonstrated by his election as president of the Western New York Agriculture society, an office of which he was the incumbent for several years and which he held at the time of his decease. He was also a member of the Genesee Falls Lodge, F. & A. M. Mr. Whitcomb was married on February 13, 1844, to Miss Tursey S. Tillotson, of Parma, New York, who survives him. He died in Rochester December 13, 1880. The late John Cornwall, who for many years was one of Rochester's best known business men, was horn in Baltimore, Maryland, on January 8, 1823. He was the eldest of three children born to Amos and Elizabeth Cornwall, and received his early education in the common schools of Baltimore. His parents moved to Rochester in 1840 and his first business in this city was the management, with his brother-in-law, of the saw-mill which was situated at the upper falls on the west side of the river. He next went with his father in the shoe business at 22 Buffalo street, and later changed it to a hat and fur store. Following that he began business on his own account at No. 1 in the Eagle hotel, and then became a partner with his father at 12 Buffalo street, where he remained until 1863, when he moved to Pittsburg with his family, where he engaged in the oil business. From Pittsburg Mr. Cornwall moved to New York and six years later came back to Rochester, bought the Crystal Palace block and made this city his home until the close of his life on January 8, 1888. Mr. Cornwall was married in 1846 to Miss Margaret Van Schuyver, who was born in 1825 on the northeast corner of Court and Clinton streets in a house still standing, and who, with her children, John B. Cornwall and Mrs. Alice F. Burton, survives her husband. Mr. Cornwall was a member of the Veteran Union Grays and was a thirty-second-degree Mason. City Assessor George F. Roth is one of those fortunate men who are exceptions to the rule that natives of a city are not usually honored as much in the place of their birth as elsewhere. His fellow-citizens among whom he was born have not overlooked Mr. Roth's qualifications for public trust, amid when the last vacancy occurred in the board of city assessors his name was no sooner proposed for the office than it was recognized as that of one eminently qualified for the position and who had not sought for it. He was the unanimous choice of his party. Mr. Roth was born in Rochester September 7, 1856. His parents were Frederick and Frederica Roth. His education was obtained in this city, where his business interests are centered, he being a director of the Rochester Carting company, a corporation doing the most extensive business of its character in this city. Mr. Roth was married in 1889 and resides at 209 Mt. Hope avenue. He is a member of the Monroe club, the Rochester club, the Whist club, and the Rod and Gun club, the Masonic order, the Elks, and the Chamber of Commerce.